This twentieth-anniversary salute goes to a duo that has been considered among the greatest DJ/MC combos ever seen. Their influence spreads all across Hip Hop and they delivered some of the best pure Hip Hop releases around. For their fifth album, these two brought a more mature, socially conscious, and emotive release than we had been used to hearing. Don’t get it wrong, this was still street, just a little more grown up, especially more than their previous effort, the mean-mugging Hard To Earn. The DJ half of this duo is revered as arguably the greatest producer in Hip Hop ever, while the emcee of the duo is considered one of the most distinguishable and influential voices in the game. This album brought them to even higher levels than Hard To Earn, and is widely noted as being their best work ever. 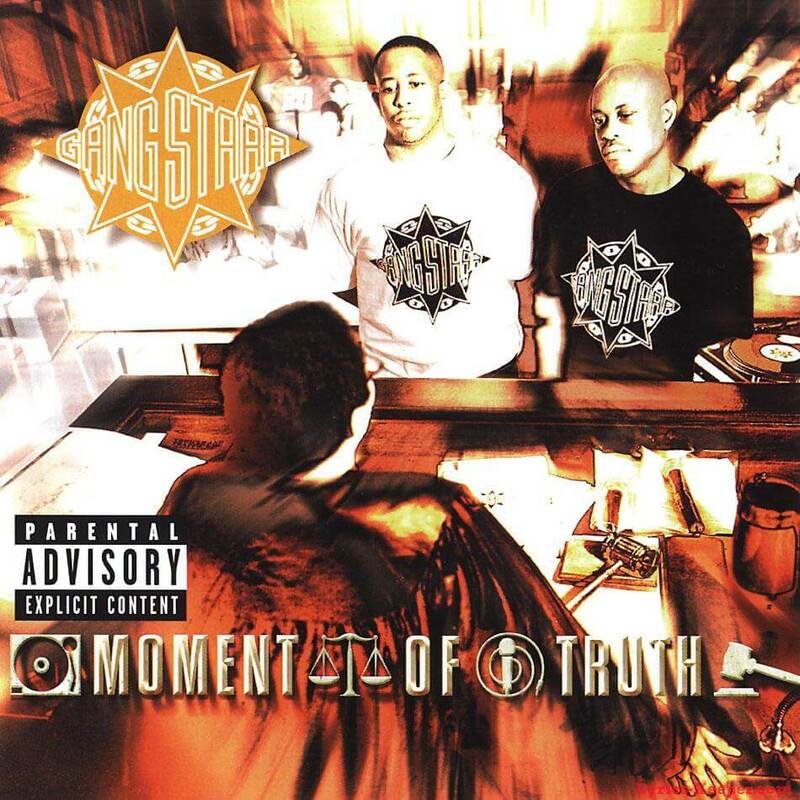 This is our anniversary salute to Gang Starr’s Moment Of Truth. The legendary Gang Starr consisted of the mighty DJ Premier and the famed Guru. Blending bits of jazz samplings with boom-bap early on was their claim to fame, delivering standout cuts like “Just To Get A Rep”, “Words I Manifest”, and “Who’s Gonna Take The Weight” to much acclaim. Their debut album, No More Mr. Nice Guy, was a solid introduction to what we would be able to expect from Premo and Mr. Gifted Unlimited Rhymes Universal. Their sophomore album Step In The Arena was even better. Considered their breakout album, Step In The Arena was filled with a lot of the same elements that caught the attention of fans in the first place, only stepped up a lot. Next came Daily Operation, which more or less doubled down on the successful formulas of the prior two efforts and included the hits “Ex Girl To The Next Girl”, “Take It Personal”, and (my personal fave) “Take 2 and Pass”. Then we got our hands on Hard To Earn, which earned them their highest charting album thanks to cuts like their big smash “Mass Appeal” and the follow-up with Nice & Smooth “DWYCK”. 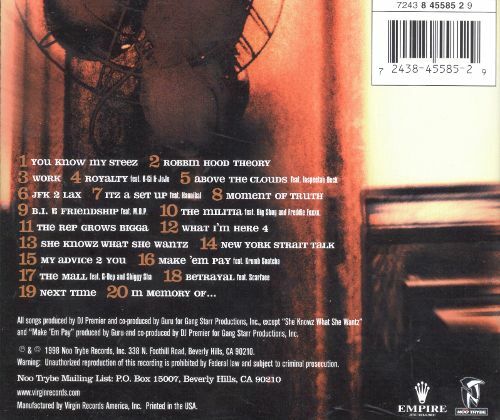 Darker and harder than previous works, this album put Premo and Guru on an even higher level. As consistent as they had been, we knew a true classic was coming at some point. Enter, Moment Of Truth. This album was just a monster. Some of Premo’s best production ever on a Gang Starr project, Guru complimented his scorching production with notable and impactful rhymes. Obtaining their first Gold plaque, the album was supported by cuts like “You Know My Steez”, the rather smooth yet unmistakably street “Royalty” with K-ci & Jojo, and the posse cut “The Militia”. Other standouts included “The Rep Grows Bigga”, the Inspectah Deck- assisted “Above The Clouds”, the Scarface-featured “Betrayal”, and the ridiculous “Make’ Em Pay”, which featured Krumbsnatcha spitting the verse of his life. The amazing chemistry between Guru and Premo continued to show its brilliance with Moment Of Truth, and there wasn’t a blemish anywhere on this album. While their next and final album, The Ownerz, was still very dope and worthy of heavy rotation, it was considered a small step down from the momentous occasion Moment Of Truth was. Guru and Premo hit their apex with this indestructible album. Unfortunately, Guru would die just over a decade after their final album due to a heart attack that left him comatose and from which he never woke up. As tragic as that was, the legacy of Gang Starr is being one of the single most influential duos in Hip Hop’s history. Happy twentieth to Moment Of Truth.